Meet Caine Monroy. 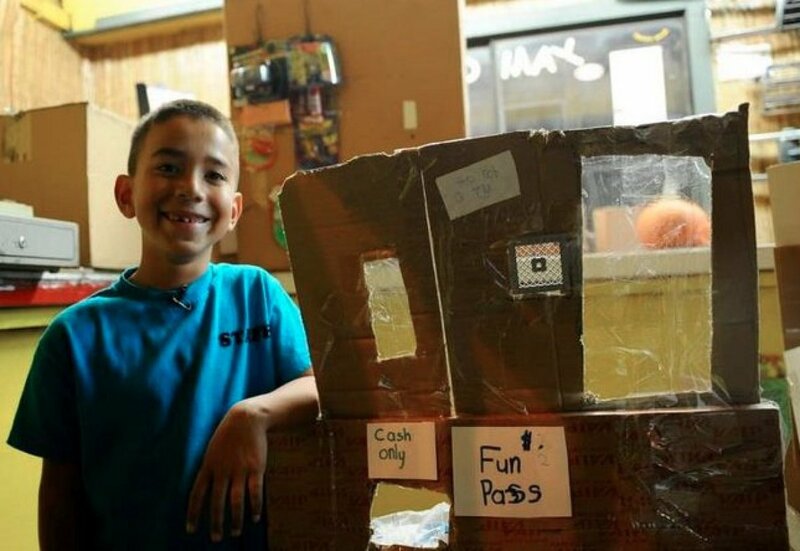 He is nine years old and he spent his summer break last year meticulously building a makeshift arcade—appropriately named "Caine’s Arcade"— made out of cardboard boxes in his dad’s auto part store. Smart Parts Aftermarket is located in an industrial part of East Los Angeles, and is predominantly a Hispanic neighborhood, according to the Census. The auto store doesn’t get much foot traffic; in fact, Caine never had a customer until filmmaker Nirvan Mullick showed up. Nirvan was so impressed by Caine’s carefully constructed arcade that he decided to make a film about it. According to Caine’s father, George Monroy, he had spent at least a year working on his "arcade". The purpose of the short film shifted when Nirvan learned that he was Caine’s first and only customer. "That really just struck a chord with me. He was creating without an audience," said Mullick in an interview with The Huffington Post, "It went viral on Reddit and got picked up by Hidden L.A. and then we decided to organize a Flashmob on Facebook." Caine had no idea this was all happening. After months of footage and editing, the film was finally ready. Fast forward to Tuesday night, when the 10-minute short film, "Caine’s Arcade", was released and made an immediated impression (viewed over 325,000 times on Vimeo). Based on the attention the film has been receiving, Nirvan decided to add a donation box for a scholarship fund on the "Caine’s Arcade" website: "Chip in $1 or more to help Caine to go to college. Imagine what this kid could build with an Engineering degree!" Nirvan’s original goal was $25,000, but since the film was released, Caine has received over $65,000. "We upped the goal to 100K, so it can cover all four years of college," said Nirvan. According to George, his friends at school don’t believe he owns an arcade. "He was proud at first but now he seems a bit shy about the whole thing," said George. "I’ve been sent at least 25 more friend requests on Facebook since the film went up, and I only had about 20 to begin with." "Oh yeah, I love Legos. I build buildings," Caine said in an interview with The Huffington Post. When asked if he was going to be working on his arcade this weekend he happily replied, "Yea!" Caine was overwhelmed with joy the day of the Flashmob. At the end of the day, after the crowd subsided, Caine turned to his dad and said, "Dad, this is the best day of my whole life." The living room is filled with all kinds of Lego constructions. "He doesn’t watch much TV," explained George, "He sits for hours and builds Legos." Let’s hope the newfound fame doesn’t change Caine’s humble heart because unlike many children his age, he still loves using his imagination.